There are a lot of baby carriers to choose from, so how do you know which one is best for you and for your growing baby. Many baby carriers can carry baby facing in or out. However, for young children under 6 months, facing out is not the ideal position for babies growth and development. African Baby Carrier has made our carriers for babies facing inward to the carer. 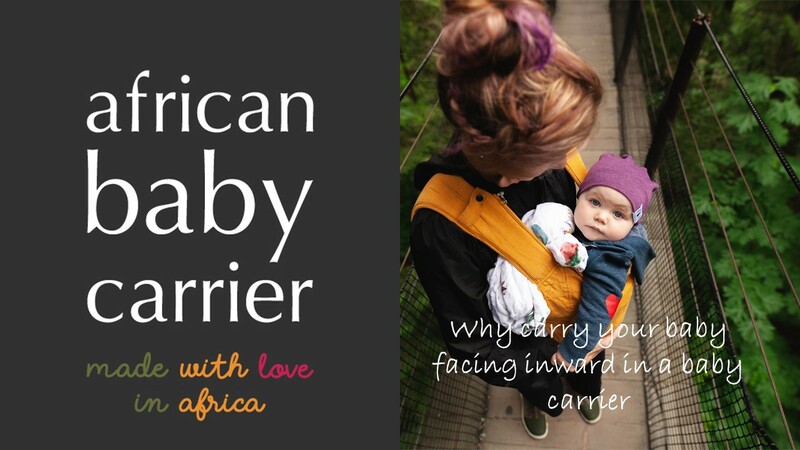 The African Baby Carrier can be worn on the front of your body or your back. Here are the reasons facing inward is best for baby. And it’s not just so their sweet little arms can wrap around you. When babies are facing forward their legs will often dangle loosely in a straight position. There may not be sufficient support for baby’s hips and thighs to be seated and aid optimal spinal development during this incredibly important period when your little one is growing in leaps and bounds. According to Fettweis a carrier which encourages the ‘M-Position’ or ‘frog-leg position’ will be acknowledged as ‘hip-healthy’. 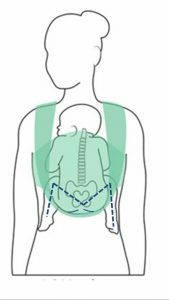 The diagram below shows the ideal position for your baby’s hip development when in a carrier, in the ‘frog-leg’ or ‘m-position’. 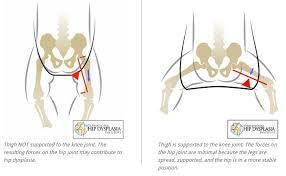 The diagram in the middle shows the babies legs dangling straight down and this is not the correct position for the hips and joints to form in. Babies under 6-9 months are very easily stimulated by the environment around them. An overstimulated baby is not easy to calm and get to sleep or even to feed. Let’s face it we are easier able to learn and assimilate new information and experiences when we are relaxed. By having your baby facing inward for as long as possible reduces overstimulation from the outside environment. Our babies are also happy when looking at a face they love and feel safe with, which is part of their emotional regulation through our facial expressions and tone of voice. At about 2-3 months of age the baby starts awakening to everything around them. Babies biggest interest at this age is the human face, watching lips smile and talk, eyebrows rise and fall, being spoken to and looking around at the environment while feeling safely close to their carer. Ultimately the caregiver (mother) naturally uses her facial expressions to communicate to the baby if it’s exciting and stimulating or dangerous and to stop. In this way baby uses the caregiver (mom) to regulate her own emotions and behaviour, hence having a good view of mom being worn facing inward. Babies initially naturally hold/ grasp things. When we have them facing toward our bodies, whether from behind or in front, they are able to tuck their little arms in and wrap them around us. This helps with feeling a little more secure and sturdy… think of how a baby baboon or monkey holds tightly onto its mom while she goes about her daily chores. We’re not too different. As your baby gets older they may want to see more of the world around them, In Maria Montessori’s wise words “Follow the Child” – they will let you know. As your baby becomes a toddler they may be too heavy to carry on your front while adequately supporting your back. Wearing the baby carrier on your back allows for more support and less backache while still keeping them close enough to cuddle.